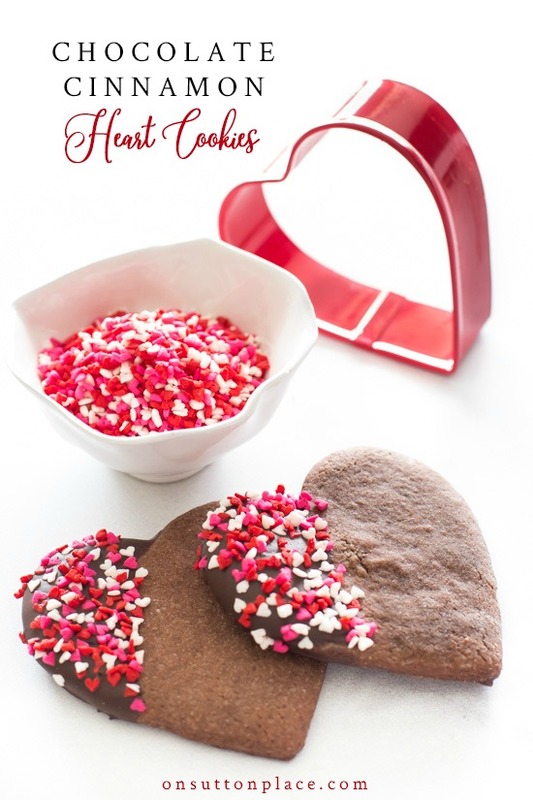 These Chocolate Cinnamon Heart Cookies are a fun twist on the traditional cut out cookie. 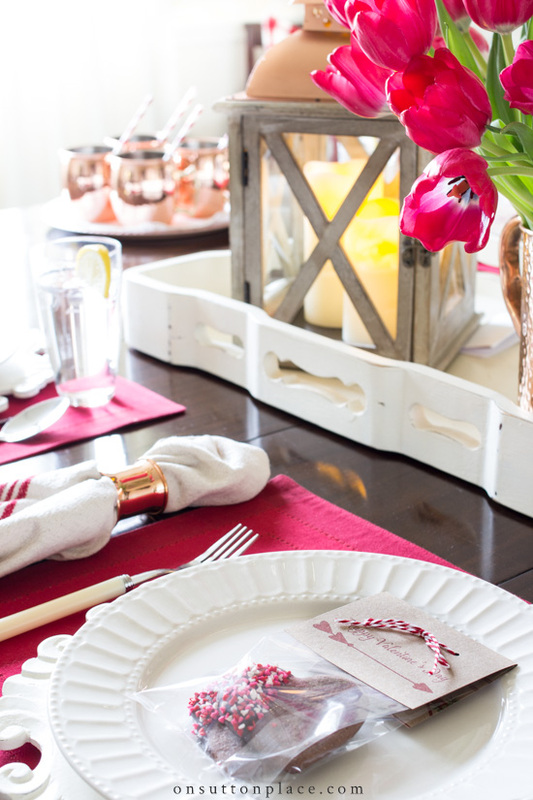 Perfect for Valentine’s Day…easy and very fun to make! Some things just go together. Peas and carrots. Bert and Ernie. Mac and cheese. One pair that I only recently discovered, and really love, is chocolate and cinnamon. My first taste was when I shared this Starbuck’s Chocolate Cinnamon Bread. I thought it was wonderful. So I looked through my cookbooks for anything with that combination and found this recipe for Chocolate Cinnamon Heart Cookies. Simple yet so pretty. 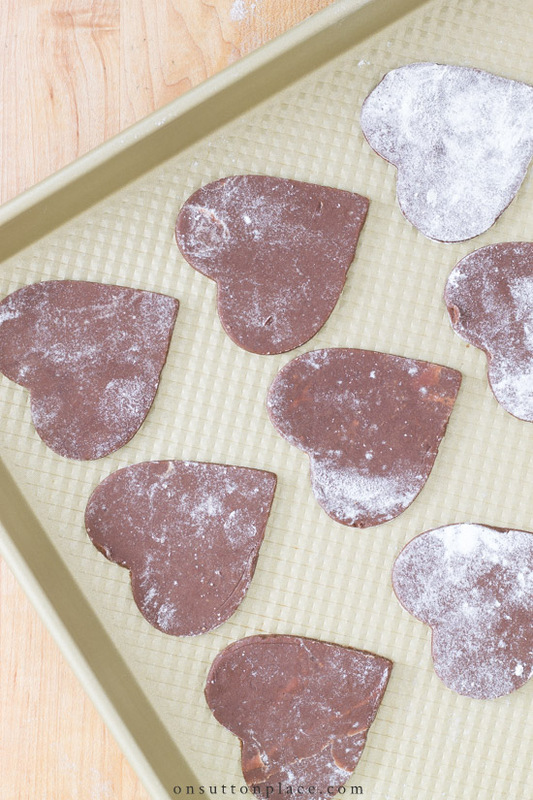 This recipe for chocolate cinnamon heart cookies went together in just a few minutes. I made the dough while my dinner was in the oven, stuck it in the refrigerator overnight, and made the cookies the next day. They felt like they took no time at all to make. 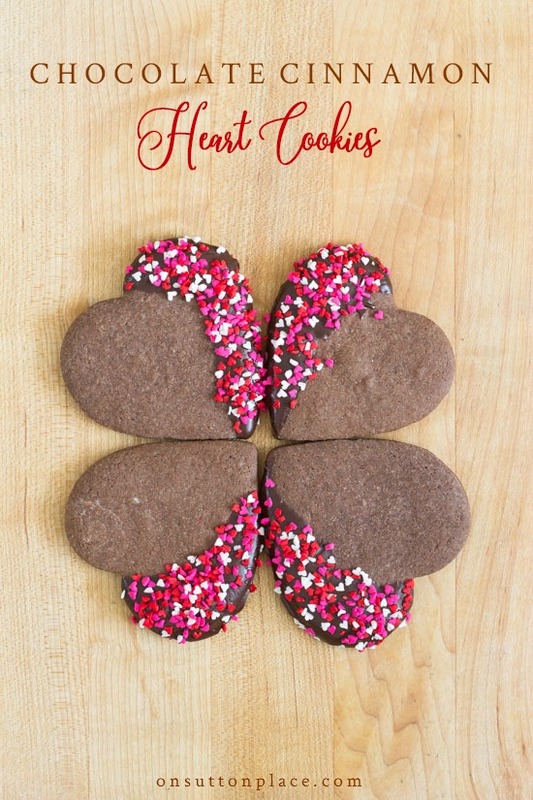 These Chocolate Cinnamon Heart Cookies are a fun twist on the traditional cut out cookie. 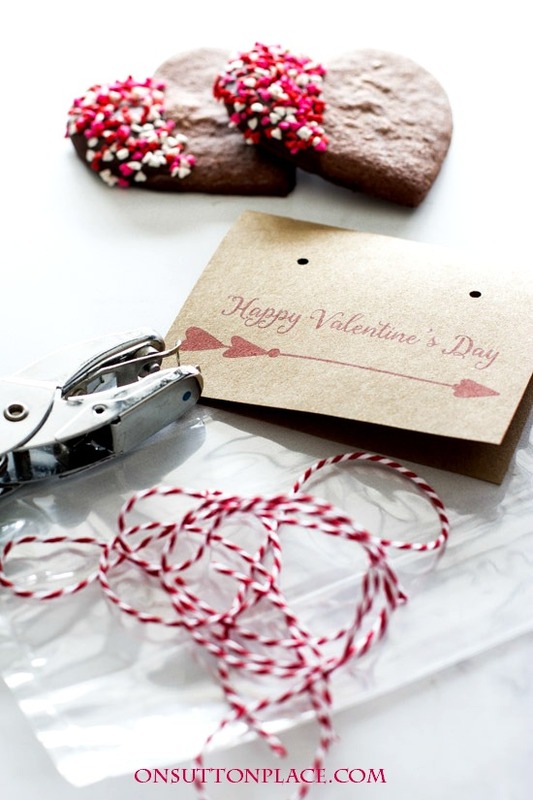 Perfect for Valentine's Day...easy and very fun to make! Beat butter and sugar for 2 minutes. Add to butter mixture in 3 additions scraping the bowl between each addition. Using a fresh spatula, scrape all the batter into a ball in the center of your bowl. Cover and refrigerate at least an hour. Can be refrigerated several hours or overnight. Divide the dough into 2 sections. Roll out, a section at a time, on a lightly floured surface. Microwave the chocolate melts according to package directions. Dip one side of each cookie in the melted chocolate. 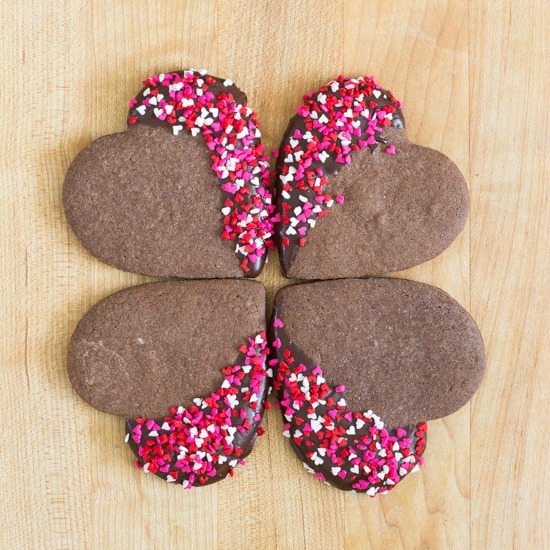 Sprinkle with hearts right away before the chocolate has a chance to harden. Store in a container with wax paper between layers of cookies. My cookie cutter is 3 inches at the widest part of the heart. This would be a perfect recipe to make with kids. They could help cut out and then also dip the cookies in the chocolate after they have cooled. The sprinkle part would probably be the most fun! These make the perfect Valentine’s Day gift. Think school parties or teacher gifts. 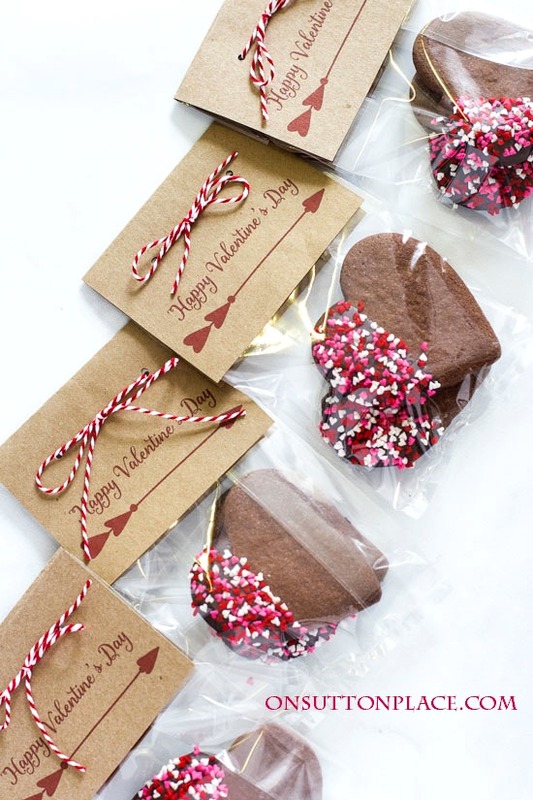 You can package them in cellophane bags tied with twine or use my free bag topper printable. Just print the toppers on card stock and cut out just inside the red outline. Fold each topper in half. Punch two holes in each topper. Place your cookies in a 4-inch wide cellophane bag and fold the top down. Place the bag topper over the top of the bag. Punch holes in the bag using the holes in the topper as a guide. Tie the bag closed with a piece of twine. You could also use staples to close the bag if you didn’t want to punch holes. I hope everyone is doing OK…this winter weather is beginning to wear some of us (including me!) down a little. If you need a distraction you can look around at these other Chocolate Recipes! I made 2 batches of these. The first ones lasted maybe 2 days in our house. So I had to make a 2nd batch to give to my son’s teachers. They raved about them! Big hit with us! Amazing blog all around! These were as easy to make and as delicious as you promised. I will definitely make them again. Instead of dipping them in chocolate I swirled a design with cookie icing. Love these! These cookies look beautiful and delicious. Although I am not a fan of a chocolate and cinnamon combination, I am a fan of pretty cookies and packaging. Thanks for posting these. Hope you have a good weekend. Your cookies look just scrumptious! Where did you get the cellophane bags? 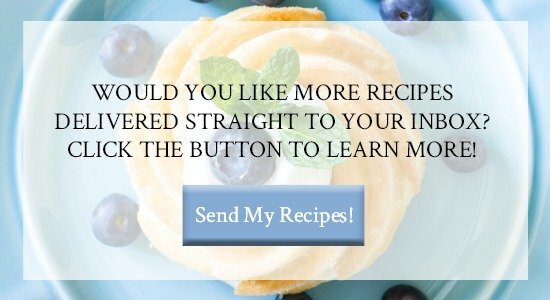 Love your idea, recipe and sharing! Hi Vanessa…there is a link in the post. The bags came from Amazon. Here it is for your convenience: http://amzn.to/2iXjiIE (it’s an affiliate link.) Thank you! 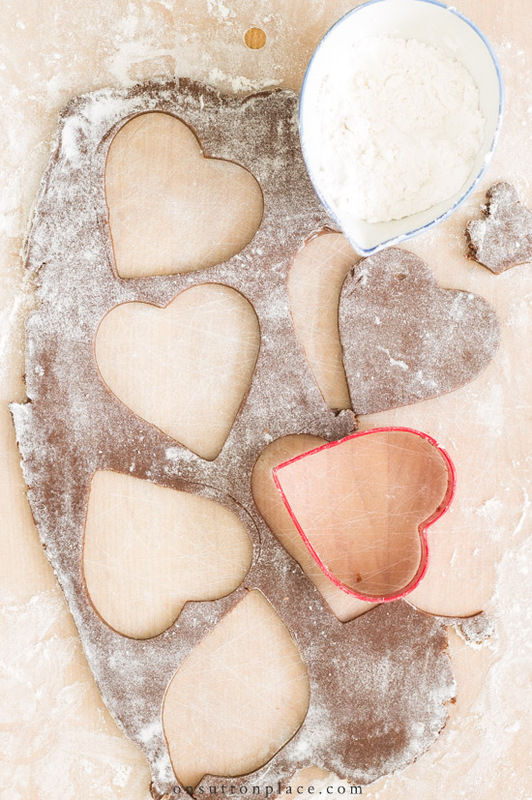 What is the size o heart cookie cutter that you used for these cookies? The cookie cutter is 3 inches across the widest part of the heart. The cellophane bags are 4 inches x 9 inches. Thanks for the chocolate cinnamon cut out cookies recipe! This recipe sounds yummy and I plan to make it for Church fellowship, but…how many cookies will get in one batch? I guess I don’t understand the knife and fork image. My apologies for responding so late to this…it got lost in my spam folder. It’s no wonder you don’t understand the knife/fork image because I never filled in the quantity number on my recipe grid! I will fix that right now. The recipe makes about 30 cookies. Again, I hope I’m not too late. Ann, you always have such pretty ideas. I love this cookie and bag topper. I teach Sunday school to children and this will be a project thy will enjoy doing. Bless you and thank you. Yum, would love to taste one! You are so sweet to always give print outs. I was wondering where you purchased the top to the cellophane bag. And there it is at my fingertips to print off. HI Ann! These cookies look wonderful & yes, fun to make! Sorry it took me sooo long to get here. Flu hit our house. We are back in good shape now & I am enjoying the tour tremendously! Hope you are well! These are so pretty, Ann! I’m a sucker for anything chocolate!! Those are gorgeous and delicious– I would love to give them to my girls teachers! Happy to be on the Valentine Home Tour with you. I love your ideas. You are very liken to the original ” do it all with style and grace Queen Martha Stewart. I am looking forward to future ideas from you. Thank you. I thought it was a butterfly cookie at first. These hearts look too pretty to eat! These cookies look so delicious. I love the combination of chocolate and cinnamon together. These are so pretty and delicious looking Ann! They would make great gifts! Thanks for the inspiration! Thanks for stopping by Shanna! The cookies look and sound delish. I enjoy your blog so much. They are so pretty Ann. What a nice treat for someone. Cute. Sharing on the HinesSight Blog Facebook page today. They not only look yummy, but they are also beautiful…! Thanks Ann! These are so pretty Ann. Sounds delicious too! Ann these look delicious! I never would have thought about that combination before,but do like both.I will have to try these.Beautiful job decorating them and photographing them too! These look absolutely delcious. We are huge cookie fans at my house and I know that this recipe will be a big hit. Those cookies look amazing Anne. They wouldn’t last long at my house. Just beautiful!! Yum, yum, yum! LOVE the combination of chocolate and cinnamon! Thank you for sharing this recipe with the Valentine Tour!